Home Interview Aleksandar Raskovic: The most powerful agent with the soul of a millennial! Aleksandar Raskovic: The most powerful agent with the soul of a millennial! Dorcol in his heart, millennial by spirit, American in the way of thinking about business. The three dots are there because it is ungrateful to make lists considering what Aleksandar Raskovic left behind in not only managerial but also in his life path. From the Air Force Academy through the Electrical Engineering faculty to Greece, which brought the sea, ships, and sailing, and with them an unexpected sailing through basketball waters. 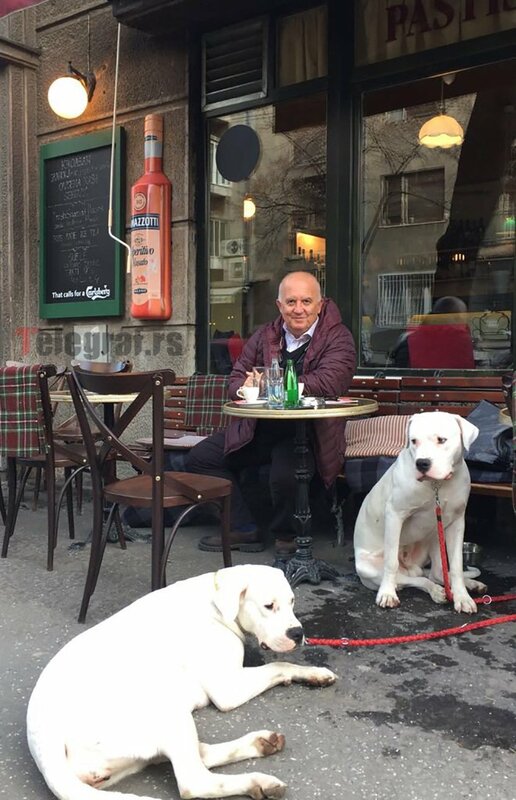 In later years, he dedicated himself to the winery “Budimir” in Zupa Aleksandrovac, bottles of this drink from Serbia are also served in Manhattan. With 28 years as in agent business, Raskovic is the first European man of the great system of the best sports agency in the world, which changed its name according to the great business of connecting or selling companies. Now, that name is Wasserman Media Group (WMG), and the owner is Casey Wasserman. If his name doesn’t mean a lot to you, its enough to say that its a man who is the most deserving for bringing the Olympic games 2028 to Los Angels and who will most definitely be the governor of California in the future, the man who is currently in the top 10 most powerful men in American Sports, which is enough to to show what is Raskovic’s position. He is the first man from these areas who became a certified NBA agent, and then he successfully headed the agencies under the names FAME and SFX Sport and Entertainment, before going to Wasserman. Raskovic is also consulted for many European, marketing and legal issues, with whom one and a half hour long talk had the elements of all three parts we listed, Serbian, Greek, and American. With the smooth jazz of a cafe shop on Dorcol, we headed to Greece and we sailed through a career with romantic waters of SFRJ basketball, with the tempest of raw business – Money is the name of the game. Aca Magellan, as his friends call him, will remind with his opinions on the quote of our greatest surgeon Bosko Djukanovic: The most important thing I learned in America – If you want to make something big, you have to eliminate two things, ego and interest. It will be felt the most when he speaks about Dusko Vujosevic who talked about him a lot at the time. However, before we get to Dule, we will raise the anchor and we will finally discover how Aca Raskovic started his managerial journey. – At that moment (the end of ’80 and star of ’90) no one did that job in these areas, in the time of the most exposed moments of our basketball. There was a change of generations, Kica, Praja, Moka, Mirza… Through Zeljko and through some other players that were there. Then there was a generation that was led by Kreso Cosic, that is well known, precisely him. The position of a sports agent appears in the sports industry, first in America, and then in Europe. – Like there is an agent in Hollywood, the insurance agent, the salesman agent, there is an agent who “sells people”. Luciano Capicchioni did it here, and he still does it. He is practically the first agent here with Miro Poljo who started representing Toni Kukoc, Zarko Paspalj… On the other side, the father of modern agents appeared who did that for a long time (Eric and Mark Flesher), the father is one of the people who created NBA and this job. Mark Flesher started working with Divac and Dino Radja and after that Dejan Bodiroga went to work with him. – Under the circumstances, I went to Greece and arrival of Zarko Paspalj was one serious milestone for the basketball machine. His arrival with Janis Joanidis transformed Olympiacos into the serious story after an attempt in Greek basketball through Aris and PAOK, which are from Thessaloniki. The arrival of mister Kokalis into Olympiacos, a more serious man, and a businessman was the arrival of a massive amount of money into the sport. Greek basketball immediately started to advance, and that coincided with the arrival of Paspalj, in 1991. The craziness about the war started to heat up, and a lot of basketballs were focused on one thing only. During his stay in Greece, Tarlac played under the name of Dragan Konstantinidis, like many players who changed their last name. Because of that and dual citizenship, there were disputes about playing for the national team, and everything started when he was supposed to go from Red Star into Olympiacos. Raskovic stepped in. – When Dragan started playing for Olympiacos, an agency appeared which was interested in him, over the friend in Israel. It was interesting to me because that agency represented Michael Jordan. I said that I wanted to help, I had no idea that I wanted to do that in my life, I just wanted to meet Michael Jordan. Everybody laughed at me, why him? Well, he is the only one interesting in this world. It was a small lawyer and I made him into a serious agent in basketball, that was David Bauman. – He sent his boss David Falk, the man who represented Jordan his entire career. Saying that Folk is a legend is an understatement, I have never met anyone like him. Through few meetings with him and sitting in his office in a period of NBA transfers, there was more work than graduating from Harward and Yale. Everything after that is a history, I started working in situation where Luciano Capicchioni is working, Vassilis Evangelinos known as Tiger, who spoke Serbian as if he is from Dorcol, Mira Poljo, and then Rade Filipovic showed up in 1997 with Bill Duffy agency, everything past that is distance, smoke, and ashes, as Bajaga used to say. Today’s situation is not lined up with the philosophy of our interlocutor, and one quote of the famous manager of Michael Jordan about the number of clients is still his guideline. – The thing about this work, what’s written down, the ordered texts… The entire thing is different. I learned one thing back then with David Falk who is still working. Falk said that you need to represent three players, not 30. But the best three. If you look what I did the entire time, I did only that. I can’t be with the player before he needs to sign the contract for the new season and next year again at the same time. That is very unfair. Everybody has rights on their own time, on their problems, the job of an agent is not to make complications with the general manager or the owner of the club, with coaches, to give them money for certain players to play, you can’t buy that. You can’t buy women. There is a problem in the tragedy of the collapse of the basketball system, European, Yugoslav, Serbian. You now have NBA drafts in the second round from Europe, and we have fairy tales, that doesn’t make any sense. – When American clubs they take a player from a home agent, something happens like “all about money, nothing personal”. Then the manager will say, come one, take this one as well for the second round. There is his obligation towards the coach, family, college to take care of him, and then what are NBA clubs doing? They spend the pick on the European player. If you look at the history of drafts from 1996 up to this date, you will see how many European players were drafted, and they never set foot in NBA. You have our players who were drafted but, no can do. CNP, cannot play. You have DNP, did not play, And you have CNP. It is clear who can play there. When Greece is mentioned, is Zeljko coming to mind? – I have been working with Zeljko for 19 years, ever since he came to Panathinaikos. Our job comes down exclusively on servicing his career and professional aspect of his career, his contract. Zeljko is a gentleman. It is an honor to know a man like Zeljko, even if you don’t work with him. His duration is especially fascinating. Every coach loses his peak after some phase and he is “eaten” by basketball changes, why is Zeljko the only one who goes on this course? – Do you know why Zeljko lasts for so long? For two reasons, he has quality, a cosmic ship for all other coaches, and second, Zeljko didn’t close any doors where he used to work, not with a single club or a president. Everybody making some combinations were chased away. Many others, and our coaches, together with our agents, created holes in Europe and they closed the doors to following generations. The door was closed. How do you look like at the parent’s aspect of the entire sports story and the creation of the career? – The current situation, wars behind us, the entire thing is very difficult and very complex. You can’t easily with 300 to 500 euros in Serbia, it’s much harder when a child goes to school and you have to buy new shoes, the prices are crazy. In that situation, a sport is like getting out of the ghetto in America. There is a fight for the stage, “I am the man”. The goal here is to survive and no one has the right to judge the parents. I always say as a joke that the greatest enemy of Serbian basketball is Srdan Djokovic. All parents would like their children to be Novak, but Novak is the greatest icon of sport ever, he jumped over all of our basketball players, he jumped everything, there is no discussion here. One of your statements was memorable even eight years ago about Bogdan Bogdanovic when he was just a beardless boy from Zitak, everything happened like you said it would. – There is an interview with me from 2010 when no one knew about Bogdan. I said that he will succeed thanks to the family because they are normal people. I didn’t make a mistake, he will yet to make something great, people don’t even know what will that be. No one knows what Divac did, everybody laughs, they make a circus of Sacramento, and no one understands how genius Divac is. How did a story with Bogdan start? – I met Bogdan and his family at the recommendation of Mr. Jakovljevic, the coach of Zitak, who did an amazing job with those boys. We started cooperating together and Bogdan lost a year and a half in Partizan in a completely wrong system. Luckily, Mr. Vujosevic came who did with Bogdan what he did his whole life, he recognized and created a miracle. He is a man who did wonders his entire career. – If I had five children and if all of them were basketball players, I would give them all only to Dule to work with them. He was the only one capable to make someone with endless talent work with all other aspects of their personality in this system of education and living, it his hard situation. Dule was a wizard at that. Not only with Bogdan, but with many other players, from Sasa Danilovic until now. I brought Vesely, Maric and many other players into Partizan because of Dule. That is interesting to hear because you had few verbal duels with him? – It’s all part of the business. I perceive the episode he had with Bogdan as part of the job, part of growing up. Remember that Zeljko sent Nemanja Bjelica into the dressing room, and then Bjelica became the MVP of the Euroleague. It is all a part of growing up, like when you start walking, and when you break your mother’s vase off of the table, perhaps your mother shouted at you, beat you up, but you become big and you learn. That’s how Bogdan became a boy who wishes to pass his knowledge to others, so he made a free camp for all most talented boys and girls aged from 13 to 16 which will be held this year in June. I am very proud of him for that. You worked with Pedja Stojakovic, you were close with Divac, unrelated to the current cooperation? – I am a friend of Divac and Serbia and Serbs don’t understand who Divac is, how much do 12 minutes of his live interview for CNN cost when the bombing started in 1999. How much second costs in a commercial on CNN. Has anybody wondered that? We started working with Pedja as an agency in 1998 when we basically signed the first largest contract for the foreign player, our player in NBA. It’s nothing compared to today’s contract, but it was a very serious contract back then, you can see the numbers on the internet. – Everything was already written and said about Pedja, phenomenal young man with three children, I was with him in Sacramento recently again. He shows maturity and seriousness in a job he is working now with Divac. That is an NBA franchise which is constantly under fire by public opinion, but, as the time goes by, I am glad that Bogdan is there. That group of young guys will find their place in the history of NBA. Nikola Kalinic is particularly interesting, he is your client, the player of unrealistic sports arrogance and courage, who had to go through a path of thorns to the national team and the European champion. – Nikola is a very specific guy. A invested a lot of work, sacrifices, and fight into himself. Why is Zeljko great? When he asked for Kalinic, everybody was in shock. He went to F4 2016 and they knocked out Real in semifinals when Vesely was injured, Zeljko won against Real which was in their strongest. Who knows basketball he can see that, who doesn’t, we are wasting our breath explaining. Fenerbahce took the title this spring, and Kalinic was among the best. We don’t hear much from you, but when you say something it was a really big story in media, like the transfer of Stefan Jovic into Olympiacos or Barcelona. Do you think that it is good going from Euroleague club into Eurocup club? – I don’t have the patience for media because everything is a click, everything is Twitter and Instagram, it is wrong… He went to a better club, the largest sports club in Germany and the most serious sports society in the world. Period. Which other club has positive finance balance in Europe? Manchester is in minus, Real, Chelsea, only Bayern is positive because they have Uli Hoeneß. Basketball just started expanding, but Uli Hoeneß could buy Lebron James if we look at the finances. One of the most sought-after players in Europe right now is Nigel Williams Goss. Partizan fans are still in disbelief that a player of this quality is wearing the Black and White jersey in these critical moments. – It was directly my decision for him to come to the Adriatic league. One other club made a mistake for not taking him, and that club published a contract, but that is their problem. Three Euroleague clubs are looking for him, and there are more. I worked with many players from the USA, I have been doing this for 28 years. Success is not recognized and not understood only in Serbia, and I don’t need that. Telegraf readers met Goss at the October interview on Bookfair when the American showed a commitment and educated side of his personality, which amazed Raskovic. – I will make just one comparison, when I met him and when I brought him to play here. I saw Holden in him. In many elements of his personality, attitudes, relations, the way he talks and takes certain remarks that are given to him, he adopts other’s opinions, I recognized Holden. He is a story that is incomparable to European basketball. He came to play for a wage of 700 dollars and he ended his career for 5 million per season. He has Russian pension and he received greatest decorations from Vladimir which can be given to foreign citizens. Speaking of Holden, how do you look at foreigners in national teams? – They don’t need to play here, but it’s all business, two-way business. Russian passport gave him a great contract in Russia, and he returned the favor to the country. Is it important to you if that happened in Serbia? – It’s not important to me, I don’t work in the association, I am not an official, I don’t have my club. I think that is a conflict of interest in the business. On the other side, there are foreigners here, and how to explain the story about the development of young players, and mostly older are playing, we bring in young foreigners to advertise them and to sell them. This time and millennials brought different postulates, principles, relations, and all of that together goes in some other direction. At the end, the end justifies the means. Dino Radja recently said that there is no manager that would make Darije Saric or Bojan Bogdanovic avoid the national team. How do you see an increasing number of decisions to skip the national team due to NBA? – It is all fake, that’s all not true. Manipulation of weak personalities and personal interest of someone who decides in the name of those people. It’s all very recognizable and very simple. Is that a generation problem, something like that was interesting for older players. Managers are often targeted by fans of our two greatest clubs on social networks and the cooperation with Red Star and Partizan is inevitable. – I cooperate with them in the same way as with Sloga from Kraljevo, Nizhny, Leskovac, Betis, Real or Bayern. There are no differences. The only difference is the number of zeros after the first number. Whether someone has a budget of a million, 10 or a 100. There are no favorites. And we reached to Raskovic’s definition of his work. This is where we come to the book of Duci Simonovic “The rebellion of the robots”, and the apocalyptic attitude about modern sport of our legendary basketball player is well known. – Did Duci write something wrong? Bread and games, what’s the difference between the Roman arena and this now. You’ve read the comic books on Conan? Each of them is some Conan. My daughter and I watch American football, business and financially the most serious sport in the world, I am a great fan. But that is also a sport where a second of commercials at the Super Bowl costs abnormally a lot. You see social networks as a modern plague? – They created a central part of life and that is what we are dealing with, people often find important to write while the game is on. Why, because they don’t have sports culture. I don’t react to the networks, I have no reasons to. Social networks and the entire setup is to manipulate with people’s personalities. Everybody would like to become everybody, to achieve success, we are not all the same. We don’t go to same schools, we are not genetically the same, we would all like to be Nikola Tesla. Social networks give us the opportunity for everybody to think that they are important. And the players today after the major victories, the first take their phones before the celebration to publish something on Instagram and Twitter? – Do you remember when Spaniards failed in Spania at the championship? They all had phones on their benches, they were all on their phones during training, do you think that’s normal? They acted all arrogant, high and mighty, and bye bye! The point of the story that today’s time is based on social networks, here, take a look here where we are sitting, there are no newspapers, but there are your and my telephones which are now turned off because we are talking, but as soon as you turn it on, there will be a lot to see. It forces you to be present all the time. You had Bogut as a first pick in the draft. When did the cooperation with him start and which client was the most favorable throughout your career? – He is a phenomenal guy, he played on World Championship when he was 18 years old, he had 40 points and 25 rebounds in one game in Thessaloniki in 2003 when we started cooperation. He went to college, and then to NBA. There were a lot of picks, I worked with some players during my career, with some until the end. Those are the people who are friends with me, I was older than them, I helped them a lot, and they helped me. The ones I started with the first are the dearest to me. The are Stimac and Bjelica from the current players? – Vlada is a very serious guy, a great man, we made a great contract in Efes and he is returning that with great games, he has valuable statistics this year despite the club instability with the changed coach. Bjelica had a tough career, he reached far, he is a phenomenal man, the father of two, he has a rough injury and he has difficulties recovering, but it will be all right. There are Dejan Musli who started playing phenomenally in Bamberg. “Do you know the difference between Michael Jordan and Jesus? Michal is a God, and Jesus Christ can’t play basketball like Michael.” That is Raskovic’s favorite NBA joke, Jordan left a great impression on him. – I was surprised, we’ve met many times. The first time we were at a lunch where he chose wines. If I didn’t know that he was a basketball player, I would say that he was from Wall Street. There is a great difference between him and other athletes. There is a certain ego with all greatest in sports, and if you don’t have it you can’t be the best. Something like that was seen in Bogdan last season, which was turbulent due to all of the injuries, but successful for conquered Euroleague. – Last year in February, when Fener lost to Vitoria, Bogdan and I set alone. We are quiet and I asked him, what now Bogi? He said: Coa, we are taking the road less traveled, but… We will make it. We could have gone the easier road. Then he rises alone against Panathinaikos and he wins two matches and takes the team to the Final Four and Zeljko took the title. The crown was won on many years of work and effort to bring the club to the throne of Europe. – Fenerbahce is a really specific story because Turkey is a really specific state. Fener was one thing before Zeljko and something completely different after him. What is happening now is a result of long-term investments into the Turkish sport. If you look at the Euroleague, in this chaos between them and FIBA, 75 percent of the budget comes from Turkey, from the pocket of a man who is Fener sponsor, Dogus group. Fener basketball hall is a gentleman’s hall, there are no football fans, the prices of tickets are high for ordinary people, that is not a crowd of PAOK, Partizan, Red Star, Panathinaikos. They are good, no question about that. Obradovic after leaving Panathinaikos in 2012 had a break and he took over Fener in summer 2013 – how did all of that look like? – That is a story I shouldn’t talk about, as the CIA does not open its documents (laughter). It is very interesting what happened, who tried what, who tried to sabotage it all. Zeljko Obradovic is handling his career on his own, all of us working for him, including me, work under a contract with him. All of us fulfill their own part of the task. He was thinking for a long time, what, how and where. He made a move. When Zeljko came to Panathinaikos from Benetton in 1999, that wasn’t the first time he got an invitation to Greece, he received one from another club in 1996. The first contract he signed was for two years. He came for 2 years, he remained 13. The contract in Fener was for 2 years, now this is his fifth year. Raskovic brought Nikola Radicevic into Red Sar this summer, but not everything worked according to the plan. – Covic and I brought him, there was a young coach on the other side that I liked very much. The way he approached to work, with pressure and critiques that needed to be withstood, but if it weren’t for Covic to support him completely, if someone else was there, who knows what would have happened… And here’s the result. Radicevic is a modern playmaker, he has the heights, he has everything, but he has too many elements, they need to fight and to find a way for each of them under the sun. This is not tennis, this is a team sport. And Borisa Simanic, who went to Beobasket? – That is a sad story. There were a lot of calls when he turned 18, John Calipari from Kentucky called 7 times, but they wanted Red Star, that is the greatest contract a young Serbian player signed in the history of Serbian basketball, the contract he got in Red Star. As an 18-year-old, no one ever got that kind of contract. He got a contract in the first year, like Jovic. He just needed to listen Aca Raskovic a little bit more, and since he listened to others, unfortunately, he is where he wasn’t supposed to be. The Euroleague has changed in format, more and more players are going to China? – That is a result of business and it won’t be any different. Business is just business. Everybody is going to China and more people will go there. Now there is Korea, the people in Asia will form something similar to Euroleague, there are countries with an enormous amount of money prepared to be pushed into a sport, more precisely, into basketball. If that happens… For example, one thing changed, they changed the limit in Korea for the height of the player that can be imported, they have risen it. There are at least 60 players who won’t go from America to Europe, but to Korea for more money. Plus, new NDBL brings two two-way contracts for each NBA-NBDL club. The base for the arrival of quality players from America to Europe has decreased, the money which is given in Europe, in Italy which has stumbled in basketball, in France, even in Germany, is a lot smaller than a money from China, Korea or Japan. Europe will feel a great impact with that. – In all of that structure of money and business distribution, the European basketball will have the players that will come who never came to Europe. On the other side, the most quality players will rush to college faster. The level of talent and quality will drop. Accordingly, Euroleague is trying to close itself before NBA makes some other moves toward Europe. Simply put, whoever is doing a business plan is tied to the marketing, they watch everything closely, listens, and here, there is a game in London in a few days. Can a city of 10-15 million people fill up the hall? Of course, it can. Istanbul is a city of officially 15, and unofficially 25 million people, 13.000 for a hall is nothing. Or 100.000 for a stadium, nothing. But the money is not there, the money is in closed cable systems, where you are selling the game like in America, and the commercials that are going there. A contract was signed a few years ago between two TV stations and NBA, worth 24.6 billion dollars. That money is divided between the clubs, and the budgets increased the salary caps. Crazy contracts, Mozgov needs over 60 million, and so on. The money to the players is a direct consequence of this increase. It is enough to see what is the cost for the second in Super Bowl, is there anything that sells more, no. They are rushing for success abroad as soon as possible, years before adulthood. – At the same time, you have the tragedy of our region, 30 or 40 kids go to trials, from Serbia, Bosnia and Herzegovina, to Spain or Italy. Every parent dreams, they think that their boy will be better than Doncic. And Doncic was the only one, and Mirotic before him. And what is between? I won’t list the names of the children that went and who don’t exist anymore if they stayed here they might have succeeded. Now, for example, you have a kid in Olympiacos (Aleksej Pokusevski) who is ultra talented, we don’t know if he will play for Serbia or will they give him the passport. Yout have Petrusev ho went to college, and not to list them. The problem is, as I already said, the feeling that everything stopped, like the ship that sailed till the end. What do you have now? Red Star, Partizan, Dinamic, a club of colleague Raznatovic. What is next? ABA 2 league – salvation for basketball or just a short-term revival on life support? – That is a genius move by Covic, the league on life support, but that is the only chance. What can Vrsac or Borac from Cacak play? I follow that a lot as well, it would be great if that could be a training ground for the development of young players, and those who get the money, on a local political level, to ask for results. And in the end, is there any sadness because Zeljko Obradovic didn’t want to try his luck in NBA? While the interview was coming to a close, Bogdan reached his new record of 22 points against Clippers, he showed again the way where is his future in NBA going to. – More experienced teammate George Hill said about him “he is not a rookie but a veteran with experience, he knows how to make a difference, to lead the match and he has defiance which pushes him to win”. Bogdan noticed that he is becoming a “boss” in his team and the time is for his teammates to understand what is the aim of the game, and not dry personal statistics for a new contract. But, this is just a beginning, like it was with Dule and then with Zeljko. And the beginning in those segments of their career always emphasized that something is yet to come… Stay tuned! Next articleAmericans marked Dodik as Putin’s “Player” in BiH?